This is a superb plugin that any producer would do well to investigate. One of the most comprehensive gates we've ever seen - and probably the most creative. The addition of mid/side splitting and an expander mode would sate the completionist in us. 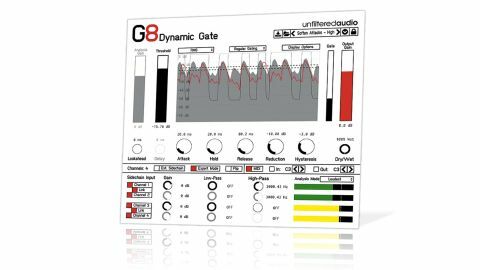 G8 Dynamic Gate from Unfiltered Audio is an action-packed VST/AU plugin that aims to be the last word in dynamic gating, expanding on its Reason Rack Extension predecessor in just about every direction. As a conventional audio gate, G8 Dynamic Gate has all the basics covered: Threshold, Reduction and Dry/Wet mix controls, AHR envelope, hysteresis, Peak and RMS modes, and up to 100ms look-ahead. The real-time display can be configured to show the input and output levels graphically, as well as the action of the gate, and the analysis signal (external or internal) even gets its own Gain fader. Alongside its Regular Gating mode, G8 also offers One Shot and Cycle modes. Cycle mode repeats the gate envelope ad infinitum for as long as the gate is open, at a speed determined by the Delay and envelope controls - a bit like an LFO and useful for tremolo chopping and AM-style effects. One Shot triggers one full cycle of the gate envelope to completion without sustain or retriggering whenever the input signal exceeds the Threshold. The Reject Outputs feature is quite ingenious. Rather than being cast into the audio ether, G8's 'rejected' (ie, gated out) signal is sent to an auxiliary output for routing to a second stereo channel in your DAW mixer, where it can be panned, levelled and processed independently - a volume-controlled 'output splitter', essentially. In terms of MIDI functionality, G8 not only accepts note input for MIDI-controlled gating, but can also output a user-specified MIDI note whenever the gate opens - handy for drum replacement in One Shot mode and generating 'granular' MIDI parts in Cycle mode. Finally, as you'd expect, the plugin can be sidechained from an external source, and both the external and internal sidechains can be high- and low- pass filtered.